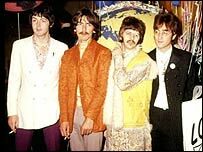 A legal battle between The Beatles' record label Apple Corps and Apple Computer, which has been heard in the High Court in London, is the latest move in a trademark dispute spanning 24 years. Their claims to the "Apple" name and logo was heard in an English court, rather than in the US as requested by the computer firm. The latest clash came after Apple Corps claimed Apple Computer's iTunes music store - which enables users to download songs to a computer or portable player such as the iPod - breaches an agreement between the two firms. But their battle began at a time when such technology had not been imagined, let alone invented. The late Beatle George Harrison spotted an advert for Apple Computer while flicking through a British magazine in 1980. He felt there was potential for trademark conflict with Apple Corps - set up by The Beatles in 1968 to release their songs and manage their creative affairs. Now owned by Sir Paul McCartney, Ringo Starr and the widows of John Lennon and Harrison, Sir Paul was responsible for Apple Corp's pun name. Apple Computer, the firm whose Macintosh machine launched the personal computer industry, was set up in a California garage in 1977. The computer firm denies its name was inspired by the fact that co-founder Steve Jobs was a Beatles fan. "There's no connection," a spokesman said. "They wanted to be in front of Atari in the phone book." 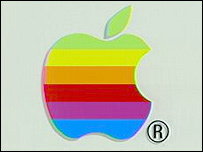 After much discussion, the two firms drew up an agreement to share their use of the Apple trademark, in November 1981. Apple Computer would use its name and logo only in the computer business, while The Beatles' company would use it in the field of entertainment. By the mid-1980s Apple Computer began to develop computers with sound capabilities, and in 1987 it sought to negotiate a new, less restrictive trademark agreement. Talks between the two firms broke down, yet in January 1988 Apple Computer enabled the Musical Digital Interface (Midi) - a device which enables computer users to create, record and edit music - to be used in its machines. When the computer firm refused to withdraw its Midi-enabled products in 1989, Apple Corps began court proceedings, claiming the computer company had breached their 1981 agreement. After more than two years in London's High Court, including a 10-day diversion to the Court of Appeal and one day in Brussels, the two sides reached agreement. While details of the settlement were never disclosed, it was believed Apple Corps emerged with around $30m (£16.3m) from the computer firm. For more than a decade, the battle between Apple and Apple appeared to be over. But in April 2003, Apple Computer launched iTunes, which allowed Mac users in the US to download songs from the internet for 99 cents each. Two million songs were downloaded in its first 16 days of operation, and six months later iTunes was launched for the Windows platform. It capitalised on a boost in Apple Computer's fortunes following its 2001 launch of the portable MP3 player iPod. 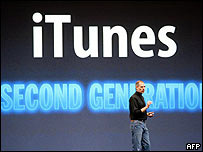 As it prepares a European version of iTunes, Apple Computer is currently the market leader in the online music industry. But in releasing iTunes, Apple Corps stated in September 2003 that Apple Computer had entered the entertainment business and breached their trademark agreement. Apple Computer responded: "Unfortunately, Apple and Apple Corps now have differing interpretations of this agreement and will need to ask a court to resolve this dispute." In considering this latest development, High Court judge Mr Justice Mann said the new clash followed shortcomings in Apple Corps and Apple Computer's 1991 agreement. He said: "If their intention... was to create obscurity and difficulty for lawyers to debate in future years, they have succeeded handsomely."